Background: The North Central Arizona Water Supply Feasibility Study (Study) was authorized on August 31, 2010 by Reclamation's Rural Water Supply Program (RWSP) under the Rural Water Supply Act of 2006, Public Law 109-451. The purpose of the Study was to evaluate the feasibility of alternative water supply components that could help meet demands of Study participants on the Coconino Plateau in Arizona. The primary source of water for the region is groundwater. Limited surface water supplies support habitat for listed and endangered species and are susceptible to drought, reducing reliability and limiting their use for domestic and municipal purposes. 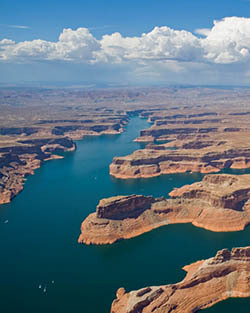 The focus of the Study was the use of Lake Powell as an augmentation water supply source and a pipeline delivery system that would convey water from the mainstem Colorado River upstream of the Grand Canyon. The alternatives pursued in the Study include a mainstem pipeline from Lake Powell to Cameron, with spur lines to Keams Canyon and to Bitter Springs to meet tribal demands only. Flagstaff will independently proceed with assessing the feasibility of a pipeline to convey groundwater pumped from the City's Red Gap Ranch to Flagstaff. This NCAWSFS interim report describes work accomplished to date and concludes the study under the Rural Water Supply Program authority. No further work will be completed for the Study under the RWSP. The Study lacked federal and non-federal funding to complete all work identified in the Plan of Study prior to pending expiration of the RWSP authority on September 30, 2016. As required under Title I Section 103 of the Reclamation Rural Water Supply Act of 2006, Final Rule Code of Federal Regulations (43 CFR Part 404) (Rule), the Bureau of Reclamation's Phoenix Area Office and Denver Technical Services Center prepared this Interim Report to summarize Study activities completed as of the date of expiration of the RWSP authority. The scope of this Study is limited to the information and data that were collected within the available budget and timeframe in accordance with Reclamation's RWSP planning guidelines. Cost-Share Partners: The Study partners include the Navajo Nation, Hopi Tribe, Arizona Department of Water Resources, Coconino County, Cities of Page and Flagstaff, and the Bureau of Reclamation.